Military sustainability and tactical battlefield flexibility that allows an ever expanding presence in Syria and Iraq. The ISIS was preceded by the Islamic State of Iraq (ISI), that was established during October 2006, and comprised of various insurgent groups, most significantly the original Al Qaeda Organization in the Land of the Two Rivers (AQI) organization, al-Qaeda in Mesopotami - led by Abu Musab al-Zarqawi, the Mujahedeen Shura Council in Iraq, and Jund al-Sahhaba (Soldiers of the Prophet’s Companions), which was integrated into the ISI. ISIS members' allegiance was given to the ISI commander and not al-Qaeda central command. The organisation known as the ISIS was formed during April 2013 and has evolved in one of the main jihadist groups fighting government forces in Syria and Iraq. ISIS regards Baquba, Iraq, as its headquarters with its allegiance to Abu Omar al-Baghdadi as the group’s emir. Baghdadi’s real name is Hamed Dawood Mohammed Khalil al-Zawi. On June 29, 2014, the ISIS spokesperson, Abu Muhammad al-Adnani announced the reinstatement of the Islamic Caliphate, with the leader Abu Bakr al-Baghdadi as as Caliph Ibrahim. The following documentaries provide insight on the history, the ideology and the tactics and strategies of the ISIS. Video Notes: 17 November 2014: The Origins of the IS: Bruce Riedel details the origins and history of ISIS (Islamic State), and how Abu Bakr al-Baghdadi came to power. Video Notes: 12 August 2014: VICE News reporter Medyan Dairieh spent three weeks embedded with the Islamic State, gaining unprecedented access to the group in Iraq and Syria as the first and only journalist to document its inner workings. Video Notes: 7 November 2014: This year, the jihadi group knows as the Islamic State swept into significant portions of Iraq and Syria, determined to reestablish the caliphate. Their expansion is only accelerating and the group is now considered the wealthiest militant organization in the world. In this week’s episode of VICE Meets, journalist Graeme Wood breaks down the groups religious ideologies and visions for the future. 9 April 2013, Baghdadi stated in an audio statement that Jabhat al-Nusra was an offshoot of ISI would be integrated into the ISIS. Jowlani (leader of Jabhat al-Nusrah) rejected the statement and therewith introduced the contest between the two groups, with Jabhat al-Nusra willing to share power and governance with groups opposed to the Syrian government whereas ISIS demanded complete control in areas. Al-Baghdadi real name is Ibrahim Awwad Ibrahim Ali al-Badri and is also known as Abu Awad or Abu Dua (Dua is the name of his eldest daughter). According to a neighbour al-Baghdadi was supervised by two prominent clerics (now deceased), namely Sheikh Subhi al-Saarai and Sheikh Adnan al-Ameen. Al-Baghdadi reportedly assisted in the formation of Jamaat Jaish Ahl al-Sunnah wal Jamaa. In either 2004 or 2005 he was captured in Fallujah by US forces. He was detained in Camp Bucca (southern Iraq, near Umm Qasr), where his status was “civilian internee,” which meant he was linked to a terrorist group but had not been caught actively engaging in terrorist activities”. His time at Camp Bucca is unclear. Abu Ibrahim al-Raqqawi, a Syrian activist, told Newsweek al-Baghdadi was held between January 2004 and December 2006. Middle East Forum researcher Aymenn Jawad al-Tamimi says that al-Baghdadi’s activities in 2005 indicate he must have been released in late 2004. It was during his time at Camp Bucca that Al-Baghdadi radicalisation was influenced by his interaction with inmates. The inmates were inspired by the abuses at Abu Ghraib, the success of al-Zarqawi and the discontent among Sunnis. Historian Jeremi Suri said that Camp Bucca was like a “virtual terrorist university”. 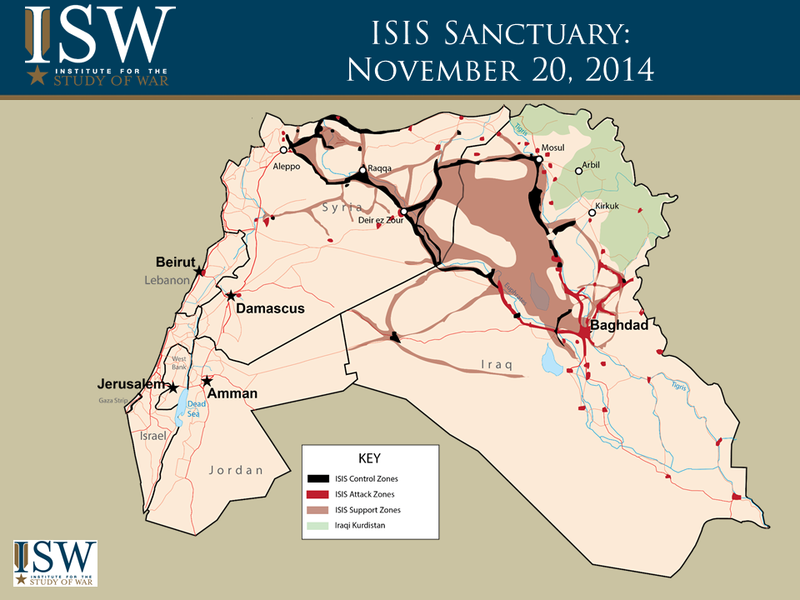 Map Notes: Institute for the Study of War: November 2014: This map, covering both Iraq and Syria, shows the extent of ISIS zones of control, attack, and support throughout both countries. The IS strategy of conquer and control, which includes both military and governance tactics, is one of the most effective in the history of modern terrorism. This strategy has one objective: to establish, expand and consolidate the Islamic Caliphate. Once the IS has secured its presence by military force, it immediately begins to take control of civilian life, which include service delivery, law and order as well of religious control. Military success followed by immediate control tactics enables the expansion and consolidation of governance. Accountability to senior IS leadership is key to the successful implementation of control once the military units have moved on to conquer additional territory. The IS strategy in gaining control over residents in towns is more than just relying on brutality such as public executions. The IS not only seeks to discredit those governing towns and cities, but to implement an alternative system of governance by means of visible presence, controlling resources such as food distributions, providing services such as health care and education and creating a system of law and order. This strategy, as informed by the IS’s extremist ideology, is implemented and maintained by local military commanders supported by alliances with local communities and tribal groups. The Political Wing’s responsibility is the formulation of policies and communicating instructions, as well as ensuring that instructions are executed. The Political Wing communicates directly to the Military Wing and is supported by the Leadership Council. The Intelligence Wing monitors the activities of the Political and Military Wings and when concerns are identified, such as suspicious behaviours or deviation from top leadership decisions and plans, the Wing reports this to the top leadership. Photo Notes: Ahmad Abousamra is suspected to be a leading figure at the IS’s Al Hayat Media Center (HMC). Accusations by the FBI and US prosecutors are mainly derived from his degree in computer science, his association with Tarek Mehanna, who is currently serving a prison sentence on terror related incidents, producing videos in response to 9/11 and his suspected presence in Syria. He has outstanding warrants for his arrest in the US relating to conspiring to support terrorists, conspiring to murder American soldiers and for making false statements to police. Photo Notes: Pro-ISIS Twitter Account: December 2014: Photos Show a market at Wilayat Fallujah. These postings depict IS controlled areas as well governed allowing "a normal life"
Photo Notes: Business Insider: Militant Islamist fighters take part in a military parade along a street in northern Raqqa province on June 30, 2014. Defend the area as part of the Islamic Caliphate, usually announced by rising the IS flag. IS presence by means of control and defence. Illustration Notes: The two senior military commanders within the IS are Omar Shishani and Abu Wahib. Video Notes: June 2014: Who is Shakir Wahib? Photo Notes: December 2014: Twitter: IS fighter targeting PKK members at the Mursitpinar Border Gate with a 23mm Sniper "Rifle"
The IS military strategy includes terrorism, guerrilla, and conventional warfare tactics. These tactics are executed by a decentralised military command structure, where IS fighting units are under the command of autonomous commanders and execute their assaults independent from one another. Herein lies another core aspect of the command strategy: the independent authority afforded to these commanders does not exclude overall accountability to IS’s war cabinet as well as the Military and Intelligence Shura councils. Decisions on the battlefront are swift and immediate and deployment of retreat and attacks are immediate, but these are all informed and fixed within an overall IS strategy determined at senior levels of command and control. The IS use of officials from the former Saddam area adds to the success, as these commanders are not only familiar with the geographical areas, but also the communities and their leaders. The ISIS fighting capacity is estimated at between 150 000 to 200 000 fighters, with self sufficient financial resources to sustain and even expand the group's capacity. In addition to oil revenue, ransom payments and the takeover of Mosul's banking system, in 2015 we are seeing diverse fraud, including substantial fraud online, abuse of the benefits system, abuse of student loans, in order to fund Islamic State. An estimated 15,000 foreign fighters from 80 states are fighting in Syria and Iraq, of which a large segment is in support of the ISIS (ISCR and The Soufan Group). November 2014 Propaganda video from the militant group Islamic State shows three French fighters calling on Muslims in France to carry out attacks there or join the group’s fight in Iraq and Syria. The ISIS financial resources are categorised into foreign sponsors from individuals within states like Saudi Arabia, Turkey, Kuwait and Qatar and local sources from Syria and Iraq. Kuwait: Shafi al-Ajmi, that admitted to the collection of funds and delivered them in person to the ISIS-linked Al-Nusra Front. Al-Ajmi also acknowledged buying and smuggling arms on behalf of Al-Nusra. Qatar: Tariq bin al-Tahar al-Harzi (32) identified by the US Treasury as an ISIS fundraiser who collected about $2 million from Qatari funders that was channelled to the ISIS. Most important, ISIS raises much of its money just as a well-organized criminal gang would do. It smuggles, it extorts, it skims, it fences, it kidnaps and it shakes down. Although supposedly religiously inspired, its actions are more like those of an organized criminal cult. To borrow from mobster Salvatore (Sammy Bull) Gravano, members in ISIS don't get ahead just by being thugs — “at some point you have to learn to be a racketeer as well." ISIS' most important revenue source right now is the smuggling of oil from the oil fields it controls in Syria and Iraq. It has been reported to control about a dozen oil fields along with several refineries. Estimates of revenue vary, but a range of $1 million to more than $2 million a day is reasonable. The ISIS controls seven oil fields and two refineries in northern Iraq, and six out of 10 oil fields in eastern Syria, allowing the ISIS to sell crude oil at between $25 and $60 a barrel. ISIS control over oil fields since taking control on Mosul include: seven oilfields and several small refineries in northern Iraq, Iraq’s largest refinery at Baiji, the Najma and Qayara oilfields near Mosul, the Himreen and Ajil fields near Tikrit. According to John Dally (Eurasian foreign affairs and defense policy expert for The Jamestown Foundation) “most of the ISIS-held oil wells (one Kurdish official estimates there are roughly 80 of them) are sealed and not producing, but according to Iraqi officials, those that are pumping are having their output sent to be processed by mobile refineries in Syria in areas controlled by the Islamic State. The fuel is being turned into low quality gasoil and gasoline, which are then brought back to Mosul for sale”. “Controlling stockpiles of wheat, along with compensating farmers for a portion of what they seize gives the ISIS additional leverage over vulnerable populations, and the longer IS can act like a state the harder it will be to dislodge it”. According to business owners in Mosul, the ISIS has a formalised system of taxation. In return for allowing business to operate, tax money is received from small merchants, petrol station owners, generator owners, small factories, big companies, pharmacists and doctors. A system referred to as Jizya (jizyah and pronounced “jiz-yuh”) is also implemented whereby non-Muslims must pay tax that should allow them protection in the Islamic Caliphate. According to al-Monitor, ISIS members in Mosul collect 50,000 dinars [$41.60] from each family as service and protection fees. The amount doubles for families whose sons did not join IS. According to US officials, the ISIS has raised $10 million or more in recent years from ransom payments. The ISIS controls more than a third of Iraq’s 12,000 important archaeological sites and reports indicate that the group is selling artifacts dating from 9,000 B.C. to A.D. 1,000 through intermediaries to dealers. Unverified reports estimate that artifacts dealings could be the ISIS second largest source of funding. The two primary black markets for artifacts are in Turkey and Jordan. The ISIS’s access to and current arsenal of weapons are well established, with the UN arguing that the group could maintain itself for six months to three years. Access is gained with weapons seized in both Iraq and Syria and black market purchases. States like Turkey, Qatar, Saudi Arabia and Croatia are suspect of exploitation by the ISIS to access and transport weapons to Syria and Iraq. Reports refer to frequent flights with weapons destined for the ISIS, from the Gulf region and states like Croatia to Turkey, from where weapons are moved over land to Syria. The ISIS also ascertained weapons produced in Russia, China and Iran.A report by the Conflict Armament Research showed that the ISIS is using weapons and ammunition from about 21 countries. Though most of these weapons were seized during armed battles in Syria and Iraq, the ISIS sustained income also indicates sufficient resources to purchase new weapons. Conflict Armament Research found that the three biggest “suppliers” of weapons are Russia, China and the US. The Financial Times reported in November 2015 on routes being used by ISIS to enable continued access to arms and weapons. The article listed the following weapons as being in high demand: rounds for Kalashnikov assault rifles, medium-calibre machine guns and 14.5mm and 12.5mm anti-aircraft guns. Isis also buys rocket-propelled grenades and sniper bullets, but in smaller quantities. The financial cost in acquiring arms is estimated at $1m, using assaults at the eastern city of Deir Ezzor as example. Map Notes: Financial Times: November 2015: Routes used for weapons smuggled to the Caliphate. Video Notes: October 2014: Islamic State appears to have picked up a U.S. air-dropped munitions pack in Kobani but the Pentagon says the vast majority have reached Kurdish fighters. WSJ’s Mark Kelly reports. New Russian T55 tanks: 30 which the ISIS used in Syria, Deir ez-Zor, rural Humus and some in Mosul and Tikrit. Photo Notes: Mashable: September 2014: M79 90 mm anti-tank rockets, manufactured in 1983 in Yugoslavia (now Serbia.) The rockets were captured in Tal Khinzir, west of Ras al-Ayn, Syria in mid-June 2014. Photo Notes: 12 December 2014: Twitter: ISIS claimed to have seized a SCUD missile in Anbar. Image Notes: The simplicity of the ISIS narrative of "us (ISIS) against them (all those that oppose the ISIS)" is centrifugal to the success of thee propaganda campaign. Screenshot Notes: From the ISIS propaganda campaign titled "The Establishment of the Islamic State". Glamour, with high level of sophistication in format in videos, photos and images. An individual initiated pillar (also referred to as ISIS Fanboys) in which ISIS supporters primarily use Twitter and Facebook to publish and distribute propaganda material as well as engaging a worldwide audience with the intent to create awareness and recruit. According to an analysis by the Recorded Future for Sky News there were approximately 60 000 pro-ISIS authors on social media accounts between May 2014 and August 2014. Since the 20 August 2014, following the release of the James Foley beheading video), Recorded Future estimated that approximately 27 000 Twitter accounts remained active. Though the ISIS and al Qaeda has similar ideologies with a shared objective, namely the establishment of an Islamic Caliphate, the to groups battle for the hearts and minds of the jihadist world has evolved into an irreconcilable break. The differences between the two groups ralate to the religious authority, tactics and future strategy. Initially al-Baghdadi took lead in the establishment of Jabhat al-Nusra (JN) and expected the JN leader's (Abu Mohammed al-Golani) to view him as senior in position. Al-Golani refusal resulted in the establishment of ISIS, with indications that approximately 65% of JN members declared their allegiance to ISIS. Aaron Y Zelin’s article “The War between ISIS and al-Qaeda for Supremacy of the Global Jihadist Movement”, published during June 2014 in the Washington Institute for Near East Policy, explains the schism between the ISIS and al Qaeda/JN as one of differences over authority and methodology (manhaj). “The leaders of al-Qaeda deviated from the right manhaj, we say this as sadness overwhelms us and bitterness fills our hearts...Verily al-Qaeda today has ceased to be the base of jihad, rather its leadership has become an axe supporting the destruction of the project of the Islamic State and the coming khilafa (caliphate)...al-Qaeda now runs after the bandwagon of the majority and calls them as ‘the Umma,’ and softens in their stance at the expense of the religion, and the taghut (tyrants) of the Ikhwan (Muslim Brotherhood). al-Qaeda in turn claims that Baghdadi did, in fact, pledge bay’ah to Zawahiri, though privately and hence has broken a religious oath. The ISIS strategy is one of territorial control accompanied by residents’ adherence to the ISIS interpretation of religious law. The ISIS also does not allow any opposing views or role players in areas conquered. JN strategy is more accommodative in that it defines its role as “one among many groups (primarily other Islamist allies) that must work together not only to fight against the Assad regime, but also to govern liberated spaces”. JN also rejects the idea of coercive adherence to its ideas and religious ideology. Zelin defines this strategy of JN as a “gradualist approach”, which aims “to socialise and normalise its ideas over time so that eventually the group can legitimately implement its more narrow interpretations of Sharia”. "Although Salafi jihadists are nourished on an anti-Shia propaganda diet, al-Qaeda Central prioritized the fight against the “far enemy”—America and its European allies. In contrast, AQI and its successor, ISIS, have so far consistently focused on the Shia and the “near enemy” (the Iraqi and Syrian regimes, as well as all secular, pro-Western regimes in the Muslim world). Baghdadi, like Zarqawi before him, has a genocidal worldview, according to which Shias are infidels—a fifth column in the heart of Islam that must either convert or be exterminated. The struggle against America and Europe is a distant, secondary goal that must be deferred until liberation at home is achieved. At the height of the Israeli assault on Gaza during the summer of 2014, militants criticized ISIS on social media for killing Muslims while failing to help the Palestinians. ISIS retorted that the struggle against the Shia comes first." Islamic State (IS) / Islamic State of Iraq and ash Sham (ISIS) / Islamic State of Iraq (ISIS or ISIL, IS), also known as Islamic State of Iraq and Sham ISIS, Islamic State of Iraq and Syria, al Qaeda in Iraq, Islamic State of Iraq and the Levant (ISIL), Islamic State, Daesh / Daish, DAISH = Dawlatul-Islam Fil-Iraqi wash-Sham is an active group formed c. 2014. TRAC Wilayat Regional Threat Assessment Project is still continuing. 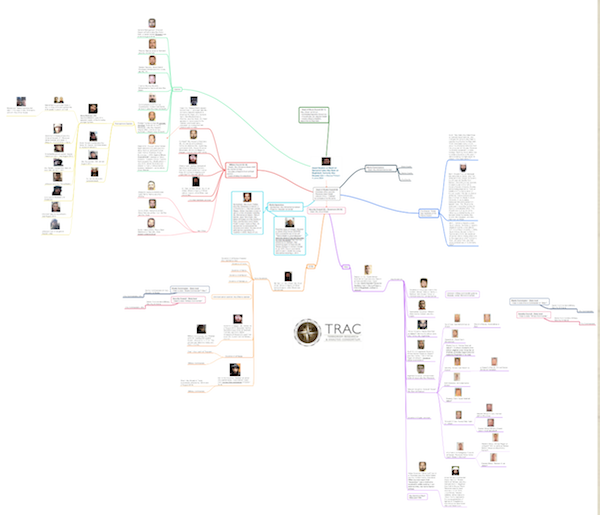 The complete list of Wilayat with logos can be found: TRAC Insight: List of Islamic State Wilayats (alt. Wilayah) By Nation. 2013 executed attacks against Shi’a Muslim pilgrims in and around Baghdad; 2013 suicide car bomber attacked a procession of Shi’a Muslim worshippers at a bus station in the town of Musayyib in the central Babil Province south of Iraq, killing 27 people and wounding 60; February 2013 a series of suicide attacks against Shi’a areas of Baghdad and around the southern Iraqi city of Karbala killed 34 people and wounded over 100; February 2013 another series of coordinated suicide bombings killed over 35 people in the several Shi’a-majority districts of Baghdad. October 2013 Human Rights Watch accused the Islamic State of Iraq and Syria (ISIS), the Nusra Front, Ahrar al-Sham, and two other Islamist factions of systematically killing at least 190 unarmed civilians and abducting over 200 on August 4 in a series of attacks along the western coastal province of Latakia in Syria. In March 2013 al-Nusra announced that its group had split in two following its leadership's public declaration of allegiance to al-Qaeda. They are said to have become disillusioned after their Syrian leader, Abu Mohammed al-Jolani, affirmed his loyalty to al-Qaeda after an apparent takeover at the top of Jabhat by hardline jihadists from Iraq. Some of the defecting rebels seem to have joined ISI, which is more of a political group to overthrow the Syrian government than an ideological group like al Nusra that wants to establish a caliphate in Syria. "Allah facilitated the establishment of the Islamic State of Iraq on 13th October 2006 under the bold and courageous leadership of Sheikh Abu Umar al Baghdadi (may Allah have mercy on him). And now we see the establishment of Islamic State of Iraq and Sham under the leadership of AbuBakr al Baghdadi, one of the most influential person of this era. 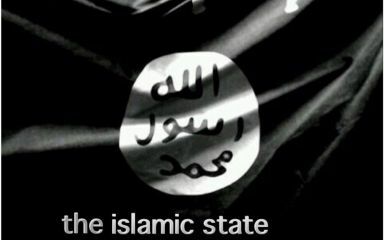 The Establishment of Islamic State in Iraq and now in Sham (Syria) is the evident sign of the steadfastedness and determination of the Mujahideen from Ahlus Sunnah wal Jamaah to establish Tawheed of Allah on Land, that is Islamic Shariah on the methodology of Prophet Muhammad (PBUH) and Sahaba, with the permission of Allah, The Establishment of Islamic State marks the Unity under one banner of Tawheed, Islamic State of Iraq and Sham about which Sheikh Osama bin Laden & Imam Anwar al Awlaki spoke and says Allah willing this is a sign of Establishment of Khilafah"
With grace, favor and guidance of Allah, and in a daring Ghazwah which Allah facilitated for it the reasons of success, and after a series of qualitative operations and Ghazwahs that shock the pillars of the Safavid project and demolished the depth of the Rafidi protectorates in Iraq during the past four months, to repel the aggression of those licentious criminals and deter them from committing more crimes after the massacre of Hawija in the Wilayah of Kirkuk. An in response to the call of the mujahid sheikh Abu Bakr Al-Baghdadi may Allah preserve him to end the blessed "Demolishing the walls" plan that began one year ago with a qualitative operation that defeats the apostate Tawagit and breaks the shackles and liberates the lions perching in the darkness of the prisons, the mujahidin brigades set out after preparation and planning for months targeting two from the biggest prisons of the Safavid government which inherited it from the crusader campaign on Iraq, Baghdad Central prison (Abu Ghraib) and Al-Hut prison (Taji). The operation began at 9 pm on the 13th of the noble month of Ramadan when the youth of Tawhid attacked simultaneously the main gates and the exterior walls of the two prisons by waves of car bombs driven by a group of martyrdom seekers the Awliya of Allah who vowed their souls to support their brothers, and the number of the car bombs that were detonated in the beginning of the Ghazwah at the gates and walls of the two prisons and after ended against the support forces that reached both locations was 12 cars of different sizes. While the roads leading to the two prisons, (Baghdad- Abu Ghraib) road and (Baghdad-Mosul) road were cut after eliminating the checkpoints spread on both roads and eradicating and dispersing its elements, this coincided with targeting the Safavid army forces near the two locations in the headquarters of the Muthana brigade and Taji camp by Grad rockets and successive bursts of mortar rounds, which secured the roads leading to both locations completely and paralyzed the movement of the ground aiding forces and aviation traffic, for the stage of storming to begin by the groups of assailant martyrdom seekers who pledged to die and all of them vowed that none of them will come out alive before liberating most of the Muslim prisoners. The clashes continued with the guards of the prison and the protection forces inside it and on the surrounding towers for several hours, and Allah facilitated the matters to the brothers by controlling all the towers and killing and injuring those in it, and combing the building from the inside with the detachments that were liberated inside the prison which were previously armed with guns, pistols and explosive belts after penetrating the security system of both prisons earlier by the security effort of the Islamic State. And in a few hours the shackles of captivity and humiliation were broken and the prisoners breathed the fragrance of pride and dignity, and we give glad tidings to the Ummah in general and the mujahidin in particular that hundreds of Muslim prisoners were liberated including more than 500 mujahid from the best sons of this land, who were hardened by wars, and refined by battles and the ordeal of imprisonment only increased their patience, steadfast and yearning for jihad for the sake of Allah and crushing His enemies, and they have been withdrawn and evacuated to secure locations which the enemy has to pass horrors and calamities to reach them which the coward Rafidah cannot endure. During the operation more than 120 were killed and tens were injured from the Safavid forces assigned to protect the two prisons and the Special Support forces "SAWT" that reached both locations, also most of the towers and installations seized by the mujahidin were destroyed and the military vehicles that couldn't be pulled from the location were burnt, during the clashes several prisoners were martyred and several others were wounded, while no one from the assailant brothers were killed except two who were injured and both them were evacuated, and the grace and favor is to Allah." Video Notes: 25 April 2014: ISIS attack on the Shia al-Sadiqoon political party. Video Note: circulated Twitter on 5.23.15 showing an IS training squad. Video: 2013 Hassan al Karamy, spiritual leader of the Islamic State, speaking in Sirte 2013. Face clearly shown. Image: Advertisement for Islamic State's encrypted messaging application. FOUNDING ORGANIZATION; Al Qaeda Organization in the Land of the Two Rivers (AQI) is also known as al-Qa'ida in Iraq, al Qaeda in Iraq, al-Tawhid, al-Zarqawi network, Monotheism and Holy Struggle, Tanzim Qa'idat al-Jihad fi Bilad al-Rafidayn, Unification and Jihad, Jama'at al-Tawhid wa'al-Jihad, JTJ, AQI al-Zarqawi Network, Organization of Jihad's Base in the Country of the Two Rivers, Tawhid and Jihad, Al-Qa'ida Organization in the Land of the Two Rivers, Al Qaeda in Mesopotamia, Jamma'at Tawhid wal Jihad , Islamic State of Iraq (ISI), Islamic State of Iraq and Al-Sham. AFFILIATE; Boko Haram (Jama'atu Ahlis Sunna Lidda'awati wal-Jihad - JAS) is also known as Jama'at Hijra Wa Takfir (JHWT), Nigerian Taliban, Taliban, Western Civilization is Forbidden, Western Education Is Sin, Western Education is Sacrilege, Jama'atu Ahlis Sunna Lidda'awati wal-Jihad, Jama’atu Ahlis Sunna Lidda’awati wal-Jihad (People Committed to the Propagation of the Prophet’s Teachings), Group for the Propagation of the Prophet’s Teachings and Jihad, People Committed to the Propagation of the Prophet's Teachings and Jihad. ENEMY; Free Syrian Army (FSA) is also known as FSA. ALLY; Islamic State Jammu & Kashmir - (Islamic State / ISJK / ISISJK) is also known as ISJK, Ansar Ghawat-al-Hind (sometimes ISJK uses).